As mentioned last year I always like to start my year wearing jeans and since this is the second time in a row we have our first outfit of the year featuring jeans I think it will become a tradition. Last year was about ultimate comfort with a cozy sweater and booties and this year I am ringing in with some remnants of New Year celebrations, glitter and a little bit of glitz. 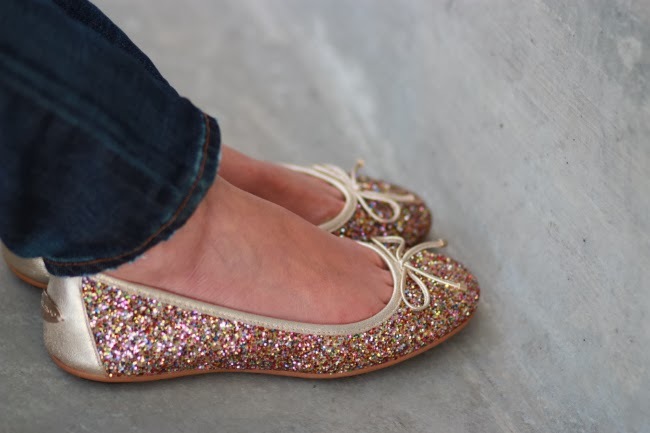 One might think that these flats are the result of the one year blog celebration pictures but no, I actually paid someone to have fun on my behalf, ha! New year, new poses! What do you think of my poses in this post? In the first picture we have the "Stand with your legs open and pretend you're looking fierce" and then in the third is "crap it looks like I need to pee so maybe cropping the picture will help" (it obviously didn't). While these poses did provide a couple chuckle I will be nixing them from my stash of poses, they just aren't doing me any favors. Haha. Jokes and sarcasm aside, I don't know how and why I decided to pose like that when we shot the pictures but they were the better ones of the bunch - there were ones that could be contenders for oopsipeedmypants.com. Ending on a light note, have a wonderful day! TGIF and enjoy your weekend!! Love the outfit and your handbag!!! Thanks Cathy! Happy new year to you and your family! Hi Jenny, this is my first post to you, I love your style, but especially adore your smile...........truly your best accessory! 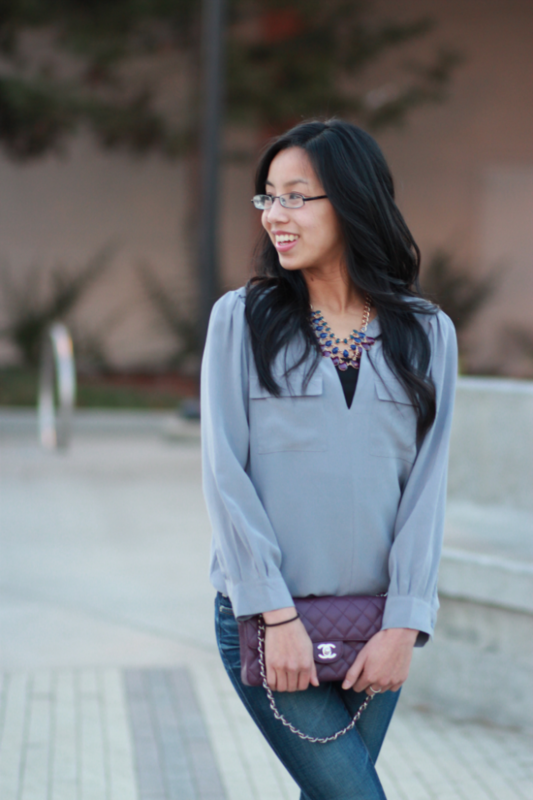 May I ask, how do you like your East West Chanel Flap? I have a Jumbo and Mini, and I have always loved the look of the East West Flap.......it seems like it could hold a bit more than a Mini because of it's width and with the single strap, it looks like a very easy style handbag to wear. Do you like yours? Thanks in advance and Happy New Year! Happy New Year to you and thank you so much for your kind words and for your time, I really appreciate it =D Hopefully your first of many to come? =D Hope you've been having a great year so far! 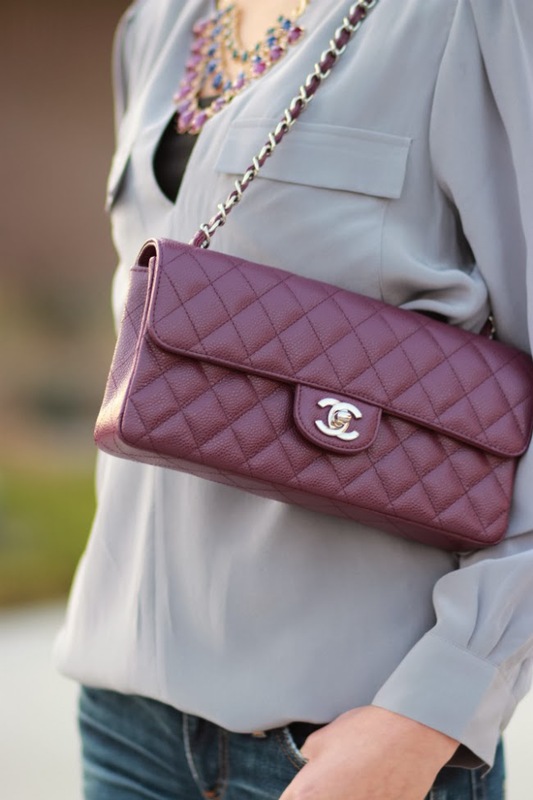 I love my east/west Chanel flap (both the classic and the choclate-bar quilted ones) and the pros outweigh the cons however I am probably in the minority seeing as how the style is discontinued (I am assuming it was discontinued because it wasn't a big seller). Do you have the rectangular mini or the square mini? I don't have either of the minis so I can't compare but if it helps my e/w measures 10" x 5.5". I mentioned some cons and one of them is the single strap. I don't mind the single strap as it is great if you intend to use the e/w as a shoulder bag and/or clutch (earlier ones had the option of one end of the strap being detachable so you can slip the chain into the bag for a sleek look) but no crossbody option which the Mini has. Though that is making me think about a DIY to make the strap longer. Overall though if you are in the market for a new size flap to add to your family, I definitely recommend searching Bonanza, eBay, consignment stores, etc. for a pre-loved one. If I can be of any help in your search or if you have any other questions, please feel free to ask, I am always happy to chat bags! Thank you again for your time! I do really love this outfit, the simplicity and the sparkle together are perfect. I don't think I've ever asked your sizing - I've been keeping an eye out for silk shirts but don't want to start with something overly large. Did this one run true to size?